In a clear show of camaraderie and personal bonding, the scions of Congress and Samajwadi Party today came together to give a call for crushing BJP's divisive politics of anger for the progress, prosperity, peace and people of Uttar Pradesh in the Assembly elections. In their first joint appearance after the alliance between the Congress and SP came through after hard bargaining, Congress Vice president Rahul Gandhi said the alliance was for three Ps(progress, prosperity and peace) to which SP president and UP Chief Minister Akhilesh Yadav added the last P(people). Days after stitching up an electoral alliance for the high stakes assembly polls, Rahul arrived here in a special plane from Delhi for the joint press meet followed by a joint road show in the state capital. The meeting also assumes significance as this was the maiden outing of the two leaders since reaching a seat-sharing agreement for the polls, which starts from February 11. Out of the 403 assembly seats, Congress will be contesting in 105 and SP the rest 298 seats. 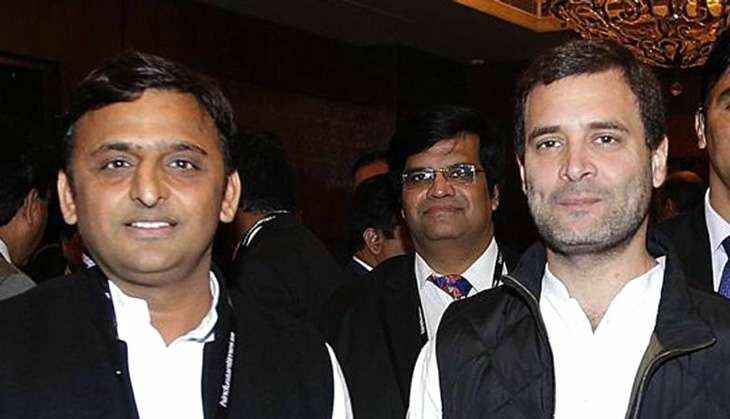 With an aim to tell people that the two parties were their choice in the elections, Rahul and Akhilesh launched the poll campaign with a tagline 'UP ko ye saath pasand hai' (UP relishes this alliance). The refrain of the duo at the crowded press conference was to send out a strong message to party cadre from both sides to work together to ensure the defeat of the saffron party. To a question on Ram Temple, Rahul said since it was a sub-judice matter, he would not comment on it. His reply came to a question on BJP's manifesto which says efforts would be made to get Ram temple built in Ayodhya within the law. Terming themselves as two wheels of a bicycle, Akhilesh said "There is not much difference in ages between us and today is the beginning." The Congress leader said partnership between Congress and SP is an answer to BJP's divisive politics of anger. "The alliance is the confluence of Ganga and Yamuna out of which the Saraswati of development will come out...We have similarities and opposition too. We want to contest the elections on similarities and will also have to do some compromises...," Rahul chipped in.